** UPDATE: We’ll be announcing the winners a week later than originally anticipated due to the amount of submissions! You all rock and we want to make sure everyone has a fair listen! Hi friends, I’m constantly amazed by the level of talent and creativity you all bring to this community. It’s time to share it with the world! We’re hosting a Mix (& Remix) Contest where you can show off your talent and win a ton of marvellous gear, music production courses & more! 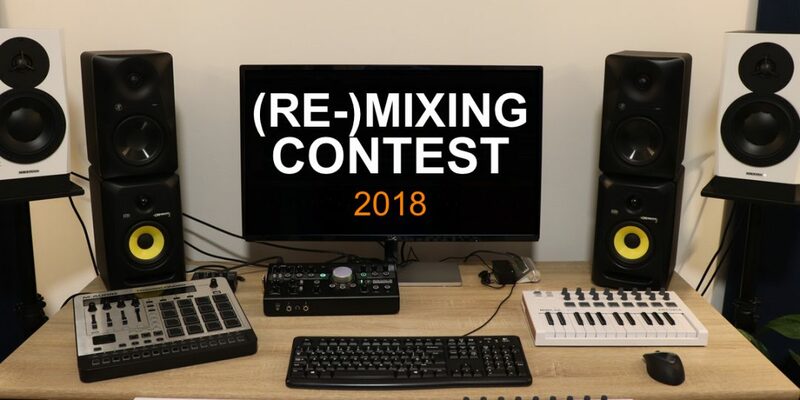 This contest is brought to you in collaboration with In The Mix, a superb educational Youtube channel, which shows you the intricacies of electronic music production, mixing and mastering. If you haven’t yet, I highly recommend you check it out! This contest features the brand-new EDM single ‘Right Here‘ by In The Mix production duo Miavono. Miavono are a UK group consisting of Brad Arthur and Michael Wynne who produce original music spanning multiple genres. After releasing their experimental debut album “Rise” earlier this year they have returned with a new single “Right Here”. Their soundscape varies from ambient electronic to energetic future house and features Brads vocals as a driving focus. The new single features bouncy electronic bass lines, energetic synths and a splash of guitar. Many thanks to our sponsors Audient, Beyerdynamic and Lewitt, who have allowed us to make this contest happen for you! They are some of my favourite audio manufacturers, not only because their products are affordable and sound absolutely fantastic! They genuinly care about the the audio community and provide excellent customer support! Have fun and get creative! Music is an artform and there is no one way to make a great record. That’s why we’re allowing you complete freedom to choose between mixing this song as is, or crafting a full-blown remix by adding your own production to it. If you choose to submit a remix, please be sure to include at least 2 original production elements in your track (e.g. Vocals & Bass). This is not a loudness competition, all tracks will be level-matched by the judges before listening. Please only submit your track once, multi-submissions will automatically be excluded from the contest. Submission ends on August 7th, 2018 at 11:59 PM PST. Any tracks submitted after this dealine will be excluded from the contest. Miavono and the Produce Like A Pro team will listen to ALL legitimate submissions to determine the winners. The winner will be announced via email, as well as on this page on August 14th 2018. Sign up to the Produce Like a Pro Newsletter and download the Multitracks of ‘Right Here’. Mix or Remix the song. Don’t be afraid to come up with something completely different! Upload your track to Youtube, Soundcloud or another streaming plattform of your choosing and use the Tag ‘Produce Like A Pro Mixing & Remixing Contest 2018’ in the description. Submit your mp3, along with a link to your streaming track to plapremixcontest2018@gmail.com. Complete your submission before August 7th, 2018 at 11:59 PM PST.